Preheat oven to 350 degrees. Place cupcake papers in the cupcake pan. In a mixing bowl, add in the butter, sugar and oil. Mix until light and fluffy. This will take about 2 minutes. Add in the room temperature eggs one at a time and mix until combined. Once they are mixed in, turn the hand mixer to high and beat for another 3 minutes until the mixture becomes thick and very pale. This is crucial otherwise the cake will fall. Measure out the milk and vanilla extract. Set aside. Measure out the cake flour, baking powder and baking soda. Add a third of the flour mixture into the egg mixture. Beat just until combined. Add half of the milk and beat until just combined. Repeat adding another third of the flour then the rest of the milk. Finish with the last bit of flour. Add the strawberries and sprinkles. Stir until just incorporated. Scoop out the batter and place in the cupcake liners. Only fill about ⅔ full. Don't overfill the liners, they batter will run out. Place in the oven and bake for 17 minutes or until done. Place a toothpick in the center of the cupcakes and if it comes out clean or with moist crumbs it's done. If there's still batter, give it another minute or two. In a large mixing bowl, add in the butter. Mix until the butter is creamy. Add in the vanilla extract, milk, and powdered sugar. Mix on low until the powdered sugar is almost completely incorporated. Turn mixer on high and beat for about 1 to 2 minutes until light and fluffy. Scoop out about ¼ of the frosting. Add in the electric purple and electric pink. Mix until combined. Add gel paste until you have your desired color. Place a 1M piping tip into a disposable piping bag. Line one crease of the piping back with the deep pink gel food color. Fill ½ of the bag with the white frosting. Add a layer of the electric purple/pink frosting. Add in the rest of the white frosting or whatever will fit. Pipe nice tall swirls on each cupcake. Top with a pink gumball. 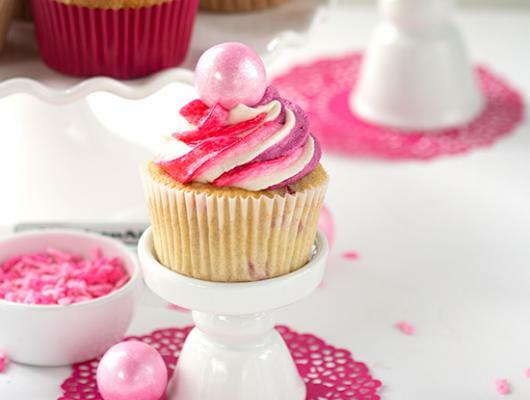 Strawberry Cupcakes - Vanilla cupcakes with finely diced strawberries mixed into the batter. 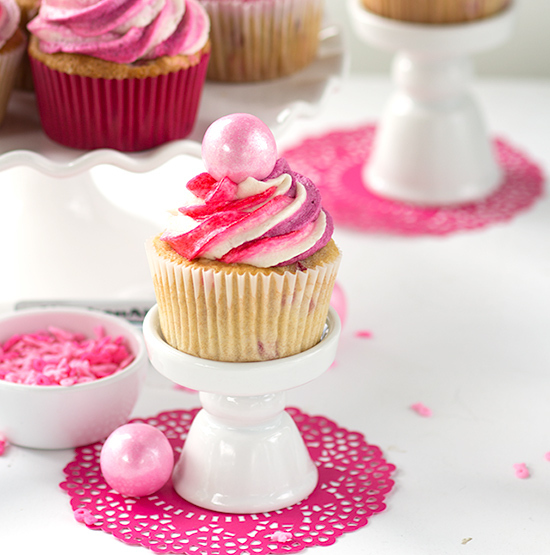 The cupcakes are topped with pinks in honor of breast cancer awareness!